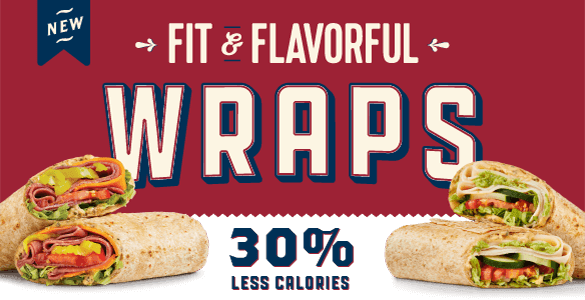 Introducing our new Fit & Flavorful Wraps! The flavor you know and love now with fewer calories, fat and carbs, all wrapped up in a delicious and hearty flour tortilla. Now that’s a win-win-win-win! Both of our wraps are excellent sources of protein and are filled with the freshest veggies available. Coming to all Erbert & Gerbert’s locations on October 16th for a limited time only. The turkey wrap is served on a 12″ Mission Hearty Grains heat pressed flour tortilla with Sabra garlic hummus, lettuce, tomato, turkey, avocado, cheese and cucumber. The roast beef wrap is also served on a 12″ Mission hearty grains heat pressed flour tortilla with roast beef, cheddar, banana peppers, Sabra garlic hummus, lettuce and tomato. Each will be available for only $6.49. Erbert & Gerbert’s, is serious about delivering total flavor satisfaction while tempting tastebuds in a whole new way. We believe you shouldn’t have to settle for the ordinary, humdrum or expected. Erbert & Gerbert’s is a place where flavor is not just a word, but a way of life. Fresh baked bread daily, meats and cheeses that are hand-sliced for freshness, and chef-inspired soup and sandwich recipes, handcrafted to pack a punch!